Stories of Apple – Who created the Apple IIgs? Who created the Apple IIgs? The first 50000 Apple IIgs were released in a special “Woz” limited edition which had identical hardware but featured the signature of Steve Wozniak on the front right corner of the case. 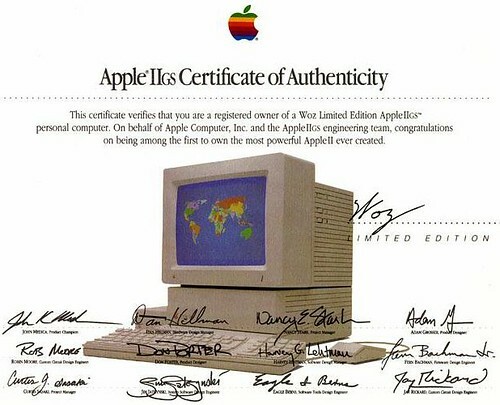 The owners of this edition were also mailed back a personal letter from the Apple cofounder and a “Certificate of Authenticity” which was signed by Wozniak and twelve key Apple employees. While Wozniak need no introduction, I think it’s important to pay a homage to the other names, which had a substantial role in the most powerful and ambitious incarnation of the Apple II line. The full list of names I managed to transcribe (and check) is: John K. Medica, Dan Hillman, Nancy Stark, Adam Grosser, Robin (?) Moore, Don Porter, Harvey Lehtman, Fern Bachman, Curtis G. Sasaki, Jim Jatczynski, Eagle I. Berns, Jay Rickard. Here is some background information on some of the names. John Medica worked for Apple from the 80s until 1993. Among his many roles he was Project Leader for the Macintosh II, Director of the Macintosh CPU Projects Group and Senior Director of PowerBook Engineering. Nancy Stark, formerly head of the Apple IIgs development team, was later appointed as the liason person between Apple and the developers group. Rob Moore, who worked on the canceled Apple IIx, was the “project hardware group manager” of the IIgs. He helped define the new graphics modes and suggested using a sound chip made by Ensoniq. Dan Hillman was also involved in the IIx project and together with fellow engineer Jay Rickard managed to put almost the entire Apple II circuitry onto a single chip called the Mega II. Hillman spent 11 years at Apple where he was directly involved in the design of Macintosh computers and led the team that developed the IEEE 1394 (Firewire) serial bus. Curtis Sasaki helped launch the Macintosh and then worked as Project Manager of Apple II projects, among whom was the IIgs. He also worked on the ImageWriter II and the Laser Writer and later went to work under Steve Jobs at NeXT. p.s. If you have further details please feel free to comment or contact me via e-mail.